Examples, solutions, videos, worksheets, games and activities to help Algebra students learn about the identity matrix. The following diagrams show examples of Identity Matrices and their properties. Scroll down the page for more examples and solutions of Identity Matrices. 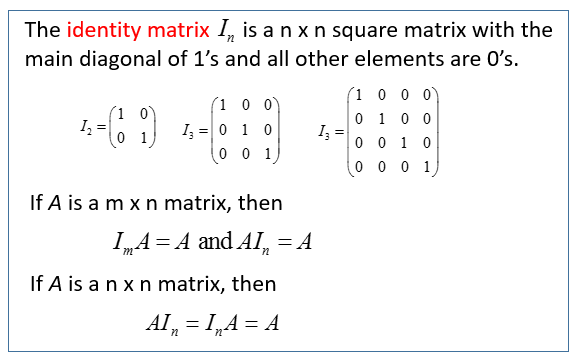 This video introduces the identity matrix and illustrates the properties of the identity matrix. Identity Matrix The Identity Matrix is a square matrix with zeros everywhere except on the main diagonal, which has all elements equal to one. It is the product of a matrix and its inverse.